The shape is roughly like one of those pieces found in a challenging jigsaw puzzle. It has bits jutting out sharply, then turning abruptly back on themselves, and there are scooping curves around the perimeter, both convex and concave. There’s even a straight stretch that would be identified as part of the puzzle’s border, but this is not a puzzle piece. It’s the shape of the three-mile route I walk each day, and refer loosely and inaccurately to as The Loop. I walk The Loop in all seasons and all weather with, it’s safe to say, as much constancy as the postman. Traversing a mostly rural area with houses dotted at irregular intervals and pastures that host horses, llamas, goats and sheep, the course is varied enough never to grow tedious. Its shape is defined by the hills it skirts, the valley it wends through, the housing development it avoids. It’s a morning in mid June. The air has the feel of summertime, yet the summer solstice is a few days away. I’m striding out along Red Dike Road, which is the equivalent of the puzzle piece’s straight edge, on the initial leg of my journey. One of the first landmarks I pass is the gray clapboard house where Josephine has lived for the past 75 years. Her yard is filled with the rainbow hues of rhododendrons and azaleas; a yellow rambling rose arches over the front gate and nearly obscures a small plaque proclaiming this as “Rose Cottage.”The property is still tidy even though these days a lawn-care service tends to the yard. Sadly, there is no hint of the giant blue delphiniums that towered over the lawn back when Josephine was in her prime. They’re near their usual spot where the willow tree hugs the side of the roadbed. On one side of their lair the Scotch broom radiates with brilliant yellow blooms; on the other, blackberry brambles repel intruders. A robin stands on a fence post and throws his entire heart into his tuneless chittering. This is a safe place. The vegetation is crushed where they’ve been sleeping. Mama is nibbling at the dewy grass and Tiny is butting his forehead at her flank, demanding his breakfast. She raises her rear leg delicately and steps over his head. He’s already had breakfast. Tiny stands knock-kneed and is left blinking in bafflement that his mama could be so cruel. I’m walking The Loop on another day. Along the edge of the road the grasses are as high as my chest. They rustle and bow in the wind and stain my clothes with fine yellow pollen as I brush past. Where the grasses have been broken over a field mouse stands upright and nibbles furiously on a seed head that has come within easy reach. He stops chewing at my approach and is ready to bolt, but I cross nonchalantly to the opposite side and the mouse decides I’m no threat. Glancing back, I see that his urgent chewing has resumed. I had heard the old coal mining town of Libby mentioned many times, but until this moment hadn’t known exactly where it was located. The workmen’s hammers echo from the surrounding hills. An entire exterior wall shudders to the ground and the huge timbers that formed the building’s skeleton are exposed. Hewn from local trees, they look as though they should have withstood the ages. Although I hadn’t known that this particular stretch of road was the site of old Libby, I had been aware of something uncanny about the location. It was as though a faint image overlay the landscape. I don’t want to call it a mirage, but there was definitely a presence, perhaps an essence of a former time. The sensation was much the same as the one I would later have in using a magnifying glass to examine the photos of old Libby. The photos were grainy and poor, and my hand would move forward and back to calculate the exact distance for the magnifier to bring the tiny dots together to form an image. Sometimes a shape would into pop into view, then dissolve into cryptic blurriness. Another day: “Hi Mama and Tiny. It’s gonna be a warm one,” I say, wiping the sweat from my forehead. The wild red roses at the side of the road are twining up into the trees. The bees create a steady hum and the song sparrows pierce my soul with their sweet melody. They’re standing in the shade and I’ve interrupted Mama in the process of giving Tiny a bath. His legs are splayed as he accepts the ministrations of her rough tongue. She cleans his forehead and mashes his oversized ears in her enthusiasm. As she scrubs his throat, he closes his eyes and lifts his head like a cat receiving a chin scratch. When she works her way on down his slender neck, Tiny loses his balance and tumbles, legs in the air, onto his side. Quick as a wink, he’s back up and nuzzling for more attention. Impatiently, Mama strikes her hoof to the ground once and continues licking. 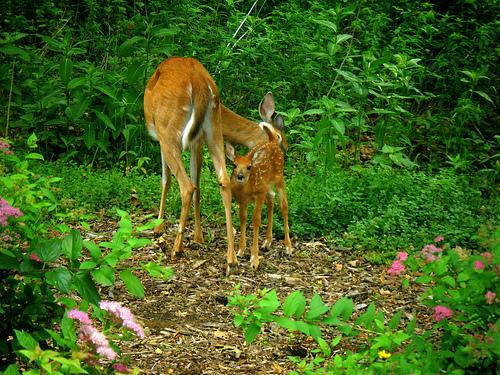 Mama is the best mother deer in the world. What good fortune. The “free” box at a garage sale yields a local history book, yellowed and brittle with age. It smells of damp, the creased paper cover looks as though it has been chewed by a dog, and in two places pages have been raggedly torn out. Among the intact pages I find photos of Libby and text describing the town as it was. I bring the book home, read it and re-read it, absorbing what information there is. The town grew up around a mine opened in the 1850s and by the turn of the century, both the mine and the town had pretty much had their day. I learn that Red Dike Road was formerly the site of a narrow-gauge rail line that carried coal cars across the marsh to Coal Bank Slough where the coal was loaded on barges. From there the coal was transferred onto ships bound for San Francisco. Best of all, the book contains six photos that pertain to Libby. One is of the old Indian woman Libby, after whom the town was named; two are of workers at the mine entrance; one is of the company store, not by the way, the building recently torn down; and two are of the town itself. These, the town photos, are the ones that interest me most. I pore over them with the magnifying glass and the more I examine them, the more I discover. What had appeared to be a jagged picket fence sharpens into the image of a clothes line bearing white sheets, pillow cases, undershirts. In the photo where a locomotive pulls a string of coal cars through the village, the entire town has turned out to be in the picture. People line the tracks and stand on their front porches. Just before going out of focus again, the magnifying glass alters a black dot into a cat sitting on its haunches. What appears to be unruly vegetation in a side yard becomes a garden full of tall dahlias. Oddly, a well-dressed couple stands arm in arm in the garden, looking for all the world like the bride and groom atop a wedding cake. I try to imagine their lives. The book accompanies me on the walk as I survey the surroundings to determine where the houses in the photos were located. I study the townsite from different angles and try to match up the photo terrain with the present-day terrain, but too many things have changed. It’s as though giant earth movers and graders have flattened and tamed the landscape beyond all recognition. Inevitably, I am stymied. It’s midsummer now and the days have a dreamlike quality. The sky is as blue as the sea and I feel certain there can be no more beautiful place on the entire earth. I visit them in the afternoon and can barely see Mama and Tiny under the canopy of the willow. My eyes adjust to the muted light and I make out Mama lying with her legs folded under. Tiny is sleeping by her side, his white spots creating the perfect camouflage in the willow’s dappled illumination. I notice the charming way a row of dots hugs either side of his slender backbone. Josephine is drowsing in her recliner by the window overlooking the bird feeder, which today is surprisingly vacant. Usually it shows as much activity as a major airport, as purple finches and chickadees zoom in and out and queue up for a turn at the seeds. Reluctant to disturb her, I start to walk away, but Josephine stirs, lifts her head, and on the third try, hoists herself out of the chair. I’m hoping she can add a few pieces to the Libby puzzle. She welcomes me into the cool, dim interior of the house, and while sitting at her chrome and Formica kitchen table, tells me the little she knows. It turns out I was mistaken; Josephine did not grow up in the mining town which had already lost most of its inhabitants even before she was born. Josephine’s father did work in the mine as a boy, but as a man raised cattle on a homestead a short distance away. She recalls that by about 1920, when she was ten or so, the mine had long been boarded up and she and other children sometimes played among the derelict houses. I show her the old photos and ask if she can tell me exactly where the houses stood. “No,” she says and shakes her head sadly before launching into a story about life on the cattle ranch. I show her the photo of the men at the mine entrance. Among them is a barefoot boy. “Could this have been your father?” I ask. Bending close to the book, she peers myopically and shrugs her shoulders. Next I show her the photo that the book identifies as the company store and explain that this, not the recently torn-down building, was the real company store. She shrugs again and I feel as though I am subjecting her to an inquisition. For half an hour I listen to her chat about the only kind of history she’s interested in, the happy days when her children were young, then bid her farewell. No new pieces have been added to the puzzle. It’s late summer now. The apples are ripening fast and I hear them fall during the night as I lie awake thinking of things lost. In the morning I tread the dewy grass barefoot and pull out the bottom of my T-shirt to form an apron for gathering the apples. Knowing deer like apples, I have washed and sliced one as an offering for Mama. She is alert at my approach. “Hello, Sweets,” I say. “Come get your apple.” She blends in with the summer-dry grass and stands a few paces from Tiny, whose attention is focused on a grasshopper. Ever the vigilant mother, she moves to position herself between me and her precious offspring. Then comes a day in early September, our most pleasant time of year on the Oregon coast. The summer winds are gone, the day dawns sweet and pure. Clusters of plump blackberries hang heavily and seem to beg to be tumbled into pie shells. Mother Nature has produced the best she has to give. I’m putting on my shoes in preparation for another turn around The Loop when the phone rings. It’s Josephine’s daughter. Her voice is solemn as she tells me that her mother has passed away. A recollection of Josephine’s hundredth birthday party last April comes to mind. Flowers overflowed the baskets that were hung all along her porch, and balloons were gaily tethered around the yard. Josephine, as regal as a queen, sat in a rocker greeting all the well-wishers who had come to pay tribute. The cries of children at play were as sharp as birdcall. Along the road cars were parked helter-skelter for half a mile. My mood is pensive enough to forego the walk for once, but I’m not immune to the day’s allure. I also have a powerful desire to see Tiny and Mama. They’re out in the field and I arrive in time to watch a small drama unfold. Tiny has gone exploring and at a shallow spot has crossed a drainage ditch that bisects the field. He has followed the ditch to a point where it’s much deeper and now wants to cross again, but can’t. He trots worriedly back and forth and lets out a small bleat that instantly brings Mama’s head erect. Her ears turn like radar antennae and with the agility of an athlete she’s across the ditch in a flash. She nudges Tiny’s behind with her muzzle, then trots ahead to show him the way. Once back across, Mama, correctly thinking I have apples for her again, lopes toward the willow where I stand. A chastened Tiny scrambles behind. A vacuum whistles inside my head; the ground tips treacherously. Mama and Tiny are not alive. They’re no more alive than Josephine. No more alive than the former inhabitants of Libby. I am struck at last by the folly of my fantasy. It was a day in very early June and I was walking. There were enough clouds gathering to have made me consider carrying the umbrella, but it had been banished to the back of the closet. As I strolled, the wind shifted slightly, the clouds miraculously stalled, then began chugging back south, the way they had come. They were replaced by blue, blue sky and a few benign wisps of white. In the marshy area by the slough a red-winged black bird, perched on one of last year’s cattails, was repeating kokely-wee-oo. With each vibrant exclamation I felt as though a ticklish spot inside my chest was being probed. The bird’s breast shone like black satin and the red band on his wing was the color of fresh blood. Overhead the swallows made their fearless swoops and dives. Approaching the curve near the big willow, I noticed a buff-colored mound off to the side of the road. Drawing closer, the shape revealed itself to be a doe that had been fatally struck by a vehicle during the night. I had seen many victims of road kill over the years: birds, raccoons, cats, rats, muskrats, possums—lots of possums. They all saddened me, yet none had affected me in the same way as the creature who lay at my feet. Even in death she was exquisite. But for the slender thread of blood at her mouth, she might have been asleep. Ludicrously, her forelegs were crossed daintily at the ankle. Her eye, the perfect liquid brown orb that faced upward, was like a jewel set in the tan velvet contours of her face and in it I saw the sky. While she was alive she would never have granted me the liberty that I took. I stroked her jaw line and ran my hand down her graceful neck. Following the path of my hand, I noticed the thickening of her middle, back near the hips. She’d been ready to deliver a fawn. The next day I could not bear the thought of walking by the doe again and took a detour. The image of her perfect eye haunted me. Yet the day after, with my thoughts elsewhere and my feet on automatic pilot, I found myself back at the place where she fell. I was horrified to see four turkey vultures tearing at her and a fifth glowering from the same fence post where the robin so often chittered. I ran at the filthy birds flapping my arms and screaming for them to get away. They lifted off heavily. Masters of high-altitude gliding, they had the agility of overfed swine on the ground. The vultures didn’t go far, just further down the fence row, where they regarded me sullenly. The birds had destroyed the eye, the beautiful eye in which I had seen the sky reflected. They had savaged the doe’s belly, and there, where her middle thickened, the unborn fawn was exposed. Before hurrying on, I caught a glimpse of its big ears and the tiny white spots on its flanks. After that, I walked by every day. What more was there to fear? I had already seen the worst. The vultures finished in just a few days; their work complete, the insects moved in. It was remarkable how fast nature reclaimed her. An image of the doe as she must have been when alive came into my mind and I became obsessed with the idea of giving her back what she had been deprived of. I pieced together an entire life for her and her tiny baby. They would live in their lair under the willow, be forever free from pain and tragedy, and never grow older. Mama would always remain the winsome young doe; Tiny, forever a week-old fawn with spots on his russet flanks and an endearing row of white daubs on either side of his sweet backbone. He would never grow into a noble buck brought down by the hunter’s gun. While watering the back-porch geraniums I duck to avoid a web; the autumn spiders are back and their colorfully patterned abdomens will grow larger in direct proportion to the shorter duration of the days. Guided by spider logic, they inevitably construct their webs in the most bothersome locations, but that’s stated from the human perspective. I’ve grown more tolerant these days and strive to coexist with them. Today I walk down the road with a paper bag under my arm. It’s late September and I have been pondering whether the action I am about to take is an impropriety. The rains are returning and the blackberry brambles are sending out runners that are beginning to creep over Mama and Tiny’s remains. One side of me says to leave them in the exact spot where Mama fell; the other says to bring them home. The truth is I cannot allow the greedy tendrils to claim them. It is time for them to be moved. There is something nearly reverent about the act of picking up each vertebra, rib, femur and miscellaneous nut and bolt that made up their skeletons. The pieces are as white and smooth as stones found on the beach. One by one they go into the bag. The jaw falls from Mama’s fragile skull. It goes into the bag along with all the other bits. There is even a tiny leg bone I am sure belonged to Tiny. They are buried under the apple tree next to Willie, a feline friend for more than 18 years. There was no need to invent a make-believe life for Willie; he had a good life, a long one. In cat years he’d probably have been nearly as old as Josephine. Josephine. Her house sits vacant, and it’s impossible for me to imagine it belonging to anyone else, but I know it eventually will. Time moves on. The Libby puzzle remains just that, a puzzle. As the soil is tamped down over the grave, the rain softly begins, and I think to myself, let the melancholy days of winter come. My mind generates a silent prayer: Please keep from harm all the tiny fawns that grow inside their mothers’ bellies. From the house I look out toward the apple tree. There stands Mama with Tiny at her side, shaking the raindrops from his ears. This entry was posted in Issue 10:3 and tagged A Midsummer Tale, Contest Winners, Creative Nonfiction, Mary Wuerth by TC Editors. Bookmark the permalink.